Indian students and social activists hold placards during a protest against the death of Kashmiri protestors in clashes between protestors and Indian security forces in India-administered Kashmir, in New Delhi on July 13, 2016. Islamabad, July 15, 2016: Senator Sherry Rehman has urged the Pakistan government to stop dithering on matters of vital strategic and foreign policy importance by re-instituting the National Security Committee of Parliament that was in place during the last PPP government. 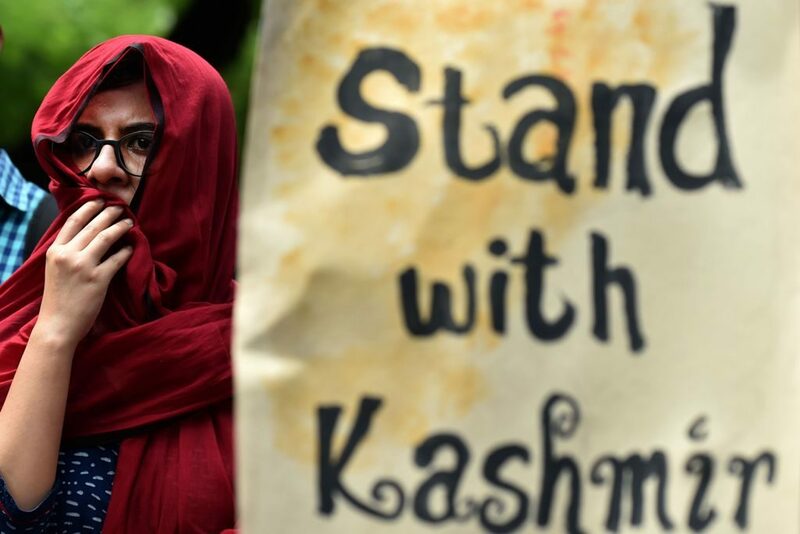 Rehman made this statement while placing an adjournment motion in the Senate to discuss the tardiness of Islamabad’s response to the unchecked killing and violent oppression of Kashmiris in Indian-held territory. “There seems to be no diplomatic strategy that Islamabad has in place other than routine condemnation of the brutal military containment of generational misery in Indian held Kashmir, where a long history of serial Indian genocide must be raised forcefully by an active and full-time Foreign Minister of Pakistan at several international forums including the UN,” the Senator stated. “We understand that there is no Zulfiqar Ali Bhutto shaheed to do the needful but Pakistan should by now have requested a meeting of the UN Human Rights Committee at the very least! Recourse to the EU Parliament is also important, given that they have a strong human rights focus in Brussels, and a clear interest in upholding fundamental rights, including the rights of the trampled Kashmiris,” she added. Regretting the marginalisation of parliamentary committees by the federal government in the pursuit of national goals, Rehman said that it is high time Pakistan at least tried to tap members of the relevant UN committees for a meeting in the mandatory time it takes to convene one even at the members ask. “It is bad enough that Pakistan lost the membership of this vital UNHR Committee, but we do have friends still holding their memberships,” the Senator stated. “Surely clear high level lobbying should have been undertaken by now with key governments to puncture the iron curtain that India maintains on controlling the Kashmiri narrative?” asked Rehman. We understand that there is no Zulfiqar Ali Bhutto shaheed to do the needful but Pakistan should by now have requested a meeting of the UN Human Rights Committee at the very least! She said that the fact that the UN Secretary General has made his own statement itself signals the gravity of the current implosion in Indian-held Kashmir after Burhan Wani’s murder amid scores of other killings and state-sponsored violence sprees. “Pakistan’s Foreign Minister should be on the phone, and shuttling between Brussels, Geneva and New York by now. The famous Kashmir Committee of the NA should have used its extensive tours to report back to parliament on years of Indian brutality, while the once-active National Security Committee of Parliament still does not exist,” Rehman said. “It shocks many that this government thinks policy can be run on auto-pilot or by executive power only. This naturally shrinks the circle of expertise they can use on matters of key public importance, and puts Pakistan on the back foot,” she concluded.